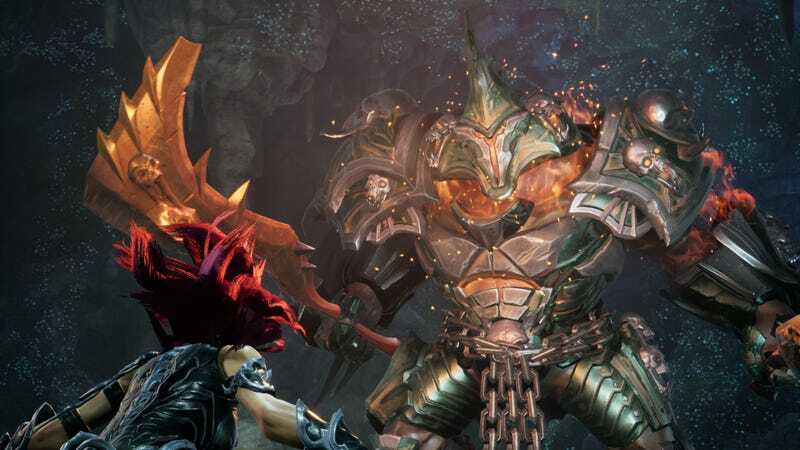 Here we see Fury, apocalyptic horseperson, facing off against Wrath, one of the Seven Deadly Sins she’s tasked with dispatching as the star of Gunfire Games’ Darksiders 3. Looks like an epic battle is about to unfold. Not really. Perhaps it’s just his nature, but Wrath isn’t much for tactics. Following an elaborate opening battle against the sin of Envy, complete with mid-stage platforming challenges, I expected more of the big guy. But no, the massive armored personification of extreme anger swings his weapon in a predictable fashion, making it easy for Fury to dodge his blows and win the battle. Or at least I think she won. Upon taking Wrath’s health down to nothing, the game jumped to a cutscene showing Fury beaten down. Wrath is nowhere to be seen. A new character, the powerful Lord of the Hallows, appears, granting Fury a fiery new weapon. And a fiery new appearance. According to the Darksiders Wiki, my copy of the game on PC somehow skipped the end of the Wrath battle. I won’t spoil what happens, but it’s a lot more dramatic than what I experienced. Something exciting happens, something that may have made me care about the game’s largely unsympathetic protagonist. In the original Darksiders, War was attempting to discover who started the apocalypse early. In Darksiders II, Death strove to clear his brother’s name and resurrect humanity. Darksiders 3’s main character’s motivation is the promise of being made leader of the Four Horsemen upon defeating the Seven Deadlies. Using a bladed whip that looks like it was pried from the hands of SoulCalibur’s Ivy Valentine, Wrath swipes and swings her way though a ruined apocalyptic landscape. The game opens in a ruined cityscape reminiscent of the first game in the series. Demons roam aimlessly among rusting vehicles and plant-choked streets. Fury, pictured here in her lightning form. It’s a promising setting, but soon those strangled streets give way to more standard fantasy fare. Beneath the asphalt lie bland blue caverns, tunneling catacombs and an amount of free-flowing lava that could only be explained by a gradual convergence of Hell and Earth. It’s more a collection of larger areas connected by tunnels and pathways than an open world, but that’s fine. I’m the type of gamer who needs a little guidance and freezes up when faced with the endless possibilities of a Breath of the Wild Hyrule or Red Dead Redemption 2‘s Old West. Were the world built in a more sensible manner, traversing the ruins of Darksiders 3 might be a joy, but the game’s design and art direction keeps getting in the way. It’s easy to get lost when the caverns look the same as other caverns. It’s hard to tell one foliage-covered cityscape dotted with abandoned cars and demons from the next. As Fury gains new weapons she earns new abilities. The fire weapon allows her to survive lava and perform what looks like a rocket jump, opening up new areas of exploration. The game’s camera doesn’t do a great job of showing the player when there’s a ledge higher up in a room that they could reach with said rocket jump. There’s a lot of backtracking and camera manipulation involved in finding one’s way around. This guy wants to eat your souls and help you fast travel between points. And then there are all of those pesky demons. This game is chock full of them. Bug demons. Fire demons. Little kid demons. Skeletons—I mean, bone demons. Sometimes they attack Fury solo, giving the game’s basic combo-style combat system a chance to shine. She swipes and snags and tosses them in the air. If she dodges at just the right time she can counter with a power arcane blow. It’s a lovely feeling. But more often demons attack in packs, which means Fury has to wildly swing while constantly dodging. It’s like Darksiders 3 is actively struggling against my enjoyment, constantly countering the things I appreciate about the game. I love the design of Fury, a powerful woman in practical armor, but so far there’s been nothing to love about her personality or motivations. I love the not-so-open world layout of the game’s environment, but I hate getting lost due to same-y scenery. And when I start feeling the groove of Fury’s raging whip-slinging combat maneuvers, a larger enemy shows up, forcing me back into a Dark Souls-ish back and forth of dodging and parrying. Dammit, Darksiders 3, just let me love you. She’s on fire you guys. I’ve played seven hours of Darksiders 3. Right now I am wandering the world, attempting to find the next Deadly Sin to battle using the game’s rudimentary Deadly Sin radar, a skull at the top of the screen supposedly pointing the way. I’ve been lost for an hour, but I think I’ve finally found a portion of ruined city I’ve not been in before. I enjoyed my time as War and Death in the first two games. I’d love to see the folks at Gunfire Games, a team containing many of the original Darksiders developers from series creator Joe Madureira’s Vigil Games, tackle a game featuring Strife, the final apocalyptic horseperson. But first I have to get through this game. I want to finish. I want to experience Fury in all her forms and splendor. I want to kill all the Deadly Sins, even if the battles against them aren’t nearly as exciting as getting there. And I want to see this chapter of the saga through to the end. But damn, Darksiders 3 isn’t making it easy.